At Goose on the Rocks, we make efficient of our time and our client's time. We never want to waste any precious event planning time so to help expedite your bartending service selection and inquiry process, we answered a few common questions we get asked regularly. We always welcome feedback and are always on the lookout to update our content. Q: What is your service area? Is there a limit on distance? A: We service all of San Gabriel Valley, Los Angeles County, Orange County and surrounding areas. We're mainly based in San Gabriel, CA and generally travel 30-40 miles. If you're unsure, please reach out to us with your venue location. Q: What are your rates? Is it hourly or in packages? A: Our rates vary depending on the size, date, location and needs of your special event. Our rates can be as affordable as $700 to $1,200 and average to about $900/event including TIP jar(s); again depending on what is required. We have packages for every occasion but in some cases should your event require an additional Bartender; we'll personalize it and discount you reasonably. We encourage you to download and answer our assessment form so we can best assess your needs. Q: Is alcohol provided in your quote? May we provide our own alcohol? And does that change the pricing? A: Because Goose on the Rocks does not have special discounts on alcohol, mixers or bar supplies we do not offer these items in our quotes. Goose on the Rocks will assist you in building a cost efficient menu and provide you a full shopping list; including bar setup equipment. We do offer purchasing services but because we steer towards saving clients money, we try not to offer this service unless absolutely necessary. Q: What does your team bring with them to events? A: Our team of professionals provides standard, mobile equipment to service an existing bar; or in most cases a mobile bar or makeshift bar. These standard tools include but are not limited to complimentary personalized menu, speed pourers, garnish tray, bar caddy, cutting board, garnish knife, beer opener, wine key, chilling tubs etc. Q: Is Goose on the Rocks, licensed? A: Goose on the Rocks has a business license in California. All Bartenders of Goose on the Rocks are also certified Bartenders. Every member of Goose on the Rocks including Bartenders, are also TIPS (Training for Intervention Procedures) [www.gettips.com] certified. Goose on the Rocks also holds a Certificate of Liability Insurance (COI) and can be personalized to your venue of choice for date requested. 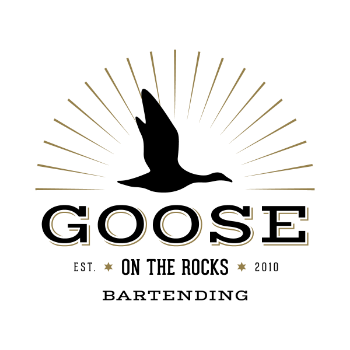 Goose on the Rocks does not hold an Alcohol Beverage Control (ABC) license. This is only required if we are selling alcohol. Goose on the Rocks does not sell alcohol. Q: What size event can GOTR handle? A: GOTR has serviced events in excess of 800 guests. For wedding events, we've managed 500 guests a few times, with an average guest count of typically 150-250 adults 21+. Unfortunately, we no longer service events smaller than 80 guests. There is also a gratuity charge for events under 120 guests. A: Unfortunately, due to availability; GOTR can no longer manage events falling on Monday through Friday. We only secure events that fall on Saturday & Sunday (ONLY).